Fr. Vincent J. De Leers O.Praem. Celebrating the life of Fr. Vincent J. De Leers O.Praem. Be the first to share your favorite memory, photo or story of Fr. Vincent. This memorial page is dedicated for family, friends and future generations to celebrate the life of their loved one. Obituary for Fr. Vincent J. De Leers O.Praem. Father De Leers resided at Santa Maria de la Vid Priory, Albuquerque, NM in 1989 serving in External and Internal Ministry until his return to St. Norbert Abbey where he remained in Internal Ministry. 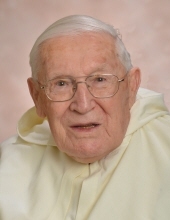 He was the 1st American Norbertine to celebrate 100 years of age. Father De Leers is survived by the Norbertine Community; daughters, Abigail (Thad) De Leers, Jessica (Jason Andrew) Lenderman and grandsons, Giuseppe De Leers-Certo and Jason Erik Lenderman. Visitation will be held at the Church of St. Norbert Abbey beginning at 8:00 AM on Saturday, 16 February 2019 with Lauds of the Dead - Reception of the Body and concluding at 10:00 AM. The Mass of Christian Burial, expressing our faith and hope in the promised glory of the Lord's Resurrection, will begin at 10:30 AM. Rt. Rev. Dane J. Radecki, O. Praem., Abbot of St. Norbert Abbey, will preside at the funeral liturgy. Rt. Rev. Joel P. Garner, O. Praem. Abbot of Santa Maria de la Vid Abbey, Albuquerque, NM will serve as homilist. To send flowers or a remembrance gift to the family of Fr. Vincent J. De Leers O.Praem., please visit our Tribute Store. "Email Address" would like to share the life celebration of Fr. Vincent J. De Leers O.Praem.. Click on the "link" to go to share a favorite memory or leave a condolence message for the family.